Democratic Progressive Party presidential candidate Tsai Ing-wen, center, celebrates her victory in Taipei on January 16, 2016. This podcast was first published by Asia Society’s Asia Blog. In January, Taiwan’s voters handed the traditionally pro-independence Democratic Progressive Party (DPP) a landslide victory, giving it control of both the parliament and presidency for the first time ever. The victory came at the expense of the long-ruling Kuomintang Party, which had opened unprecedented business and tourism exchanges with mainland China over the past eight years. Many Taiwanese people say these exchanges have failed to deliver the promised economic benefits and are making the island vulnerable to increasingly aggressive leaders in Beijing. The DPP win is the latest of many signals that Taiwanese are growing ever more skeptical of the mainland, and that China is failing in its long-running strategy to entice the island back peacefully. 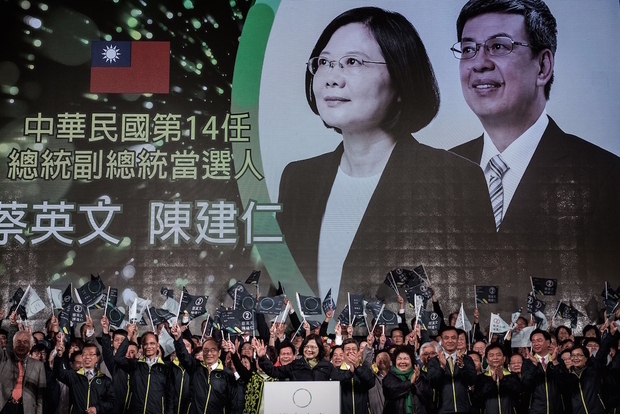 In this episode of the Asia Society Podcast, we explore how Taiwan has continued to drift further away from the mainland psychologically, and we look at the the implications of a new Taiwanese government that is less friendly with Beijing. We hear from Jerome Cohen, Director of the U.S.-Asia Law Institute at New York University (NYU); Douglas Paal, a former unofficial U.S. representative to Taiwan as Director of the American Institute in Taiwan; and Yu-jie Chen, a research scholar on human rights developments in Taiwan and China at the U.S.-Asia Law Institute at NYU.